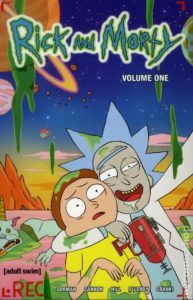 Graphic Novel Review 16 of 365: Rick & Morty – Oni Press Week! Please check out my previous Graphic Novel Reviews here. For those of you back in the Central Time Zone thinking I missed a day…joke’s on you; I’m writing this from the ocean, and it’s 10:04 P.M. here! 16 for 16 thus far! Welcome to day three of Oni Press Week! This week I’ll be featuring reviews of a bunch of cool titles from the good folks over at Oni Press. Get excited because today we Get Schwifty! As you may have known, the television show Rick and Morty came back this past Sunday with Season 3, Episode 2 (Episode 1 was released on April 1st). I had a D&D session that ended with us all watching the episode to cap the perfect nerd evening! I was a late addition to the Rick and Morty army. Actually, my wife and I just binge-watched ALL of the episodes a couple of weeks ago, and I’m kicking myself for not watching it sooner. As many people say, it’s both the smartest and dumbest show on television. But the smartest parts of the show are brilliant! However, if I do not know you, I will not recommend it because it can get raunchy, so know that going in. It also gets dark…very dark. But dang is it clever. But this isn’t a blog dedicated to television reviews. Oni Press publishes the Rick and Morty comic that you might not know about. A lot of popular shows have (had) monthly comics, and many of these titles go unnoticed by the general public, especially if you do not frequent a comic book store. For example, in my classroom I have Futurama comics, Bob’s Burgers comics, and Simpsons comics. “Interesting, but how are they?”…you may be whispering at your desk while reading this. If you are a fan, they are fun. 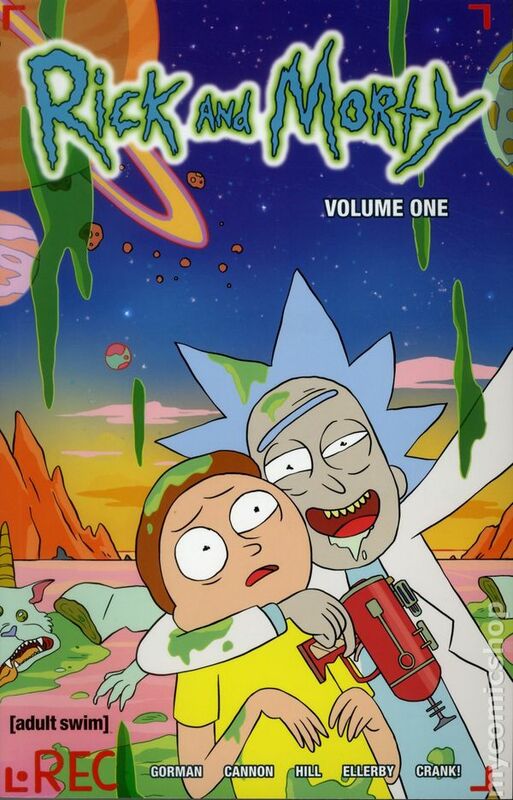 I have a little trouble with the timing of the jokes in a lot of these titles because a lot of the comedy is written for certain pacing, but if you are just looking for more Rick and Morty, then go get the comic. I just finished Vol. 1, and there were some amazingly on-point Rick and Morty moments. Enough for me to recommend this book to R&M fans. These types of books do not end at cartoon comedies either, there are Star Wars books, Star Trek books, old school action cartoons like G.I. Joe, etc. You just need to hit up a local comic book store and ask where their popular T.V. show comics are, OR Google to find out if one of your favorites has been made into a comic. Don’t expect to find Three’s Company or anything, but there are some great ones out there waiting for you. You know that this R&M comic has been out since 2015, right? Meaning, there are plenty of R&M comic stories to keep you busy between episodes. I know I’m going to check out the Vol. 2 soon. Remember, Rick and Morty is adult in nature. Hence my 17+ rating. Not all cartoons are for kids.